As part of continuing efforts in the Southwest to develop and improve transit systems, the City of Austin has announced its intention to build an urban rail system known as UltraRail that will run through the city’s eastern downtown. Traffic in east downtown Austin is beastly. It is largely made up of drivers who have short commutes, who together create major congestion during rush hour. For this reason UltraRail is being designed as a light rail/streetcar hybrid. It will be built with sharper control sensibilities, allowing for tighter corner turns, and regularly spaced, relatively close stops along the route that will hopefully make it a viable alternative to driving. But the heavy-duty installation is no light matter. 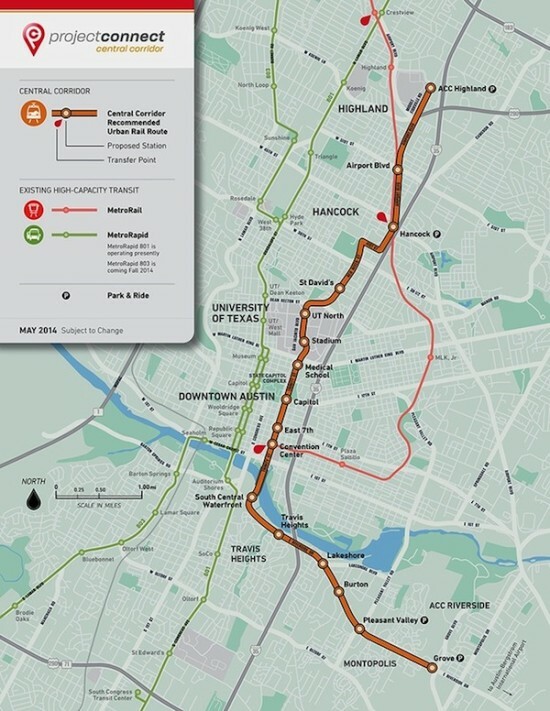 Depending on how plans solidify, UltraRail is estimated to cost $1.6 billion. Half of the money will be paid by federal dollars; the other half will come from obligation bonds. Austin is currently working with stakeholders to determine the exact length and placement of the UltraRail system, and how best to phase the project. In addition to ironing out the technical wrinkles, the usual hurdles remain: nailing down the specifics of budget, design, and pushing through the various planning stages in order to begin building. Completion is presently slated for 2020.